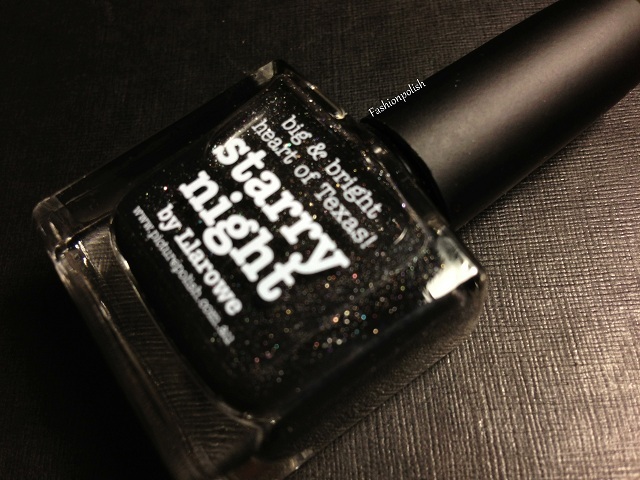 Fashion Polish: piCture pOlish Starry Night by llarowe! piCture pOlish Starry Night by llarowe! OMG piCture pOlish has just released a new collaboration shade! With llarowe! And it's a black holo!!! piCture pOlish Starry Night is decribed as a "charcoal jelly scatter holo with multi-colour sparks as well as holo particles". Basically it's a black jelly packed with the piCture pOlish signature scattered holo but also some very small rainbow particles! How awesome does that sound? For a black nail polish lover like your truly, it pretty much sounds like heaven LOL. I found formula to be a little more sheer than the previous PP scattered holos and although it applied like a dream and looked good in 2 coats, I used 3 in these swatches and found that the last coat added extra depth and sparkle. piCture pOlish Starry Night retails for AU$12 and can be purchased directly from piCture pOlish.com.au and llarowe.com (US price : $14.50). llarowe is currently the only stockist to sell Starry Night. Me too! I love black so I'm so glad Leah Ann and the PP team released it! Thank you Jeanette, I loved your swatches too, drool worthy! This is so so beautiful!! I have already ordered it...! YAY!!! I'm sure you'll love it even more in person! Love your swatches and thank you so much for the shout out! Oh my this is soooo gorgeous! I know right? So beautiful, black at its best! so pretty- reminds me of Zoya Storm. I like the quote from the bottle, since I am from Texas!